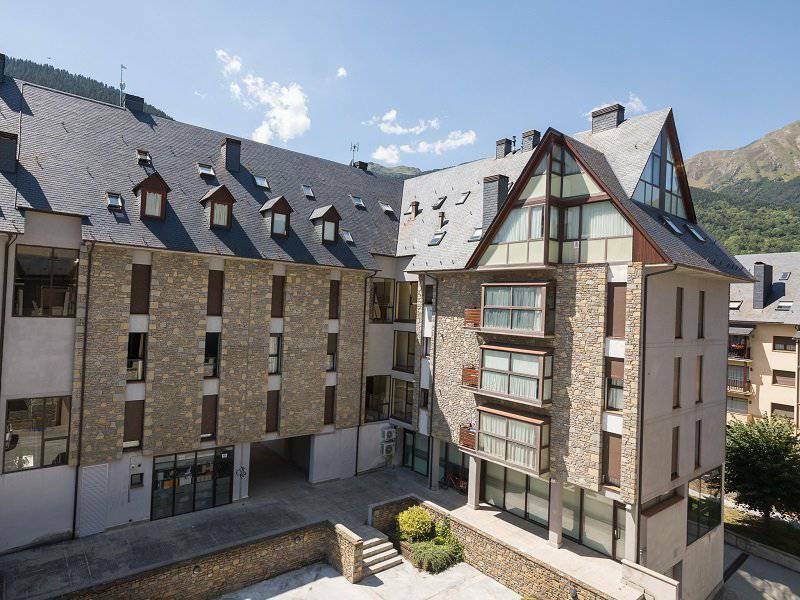 Holidaying at the Aparthotel La Vall Blanca means you can enjoy staying at an apartment complex in Vielha near Baqueira Beret, one of the most naturally beautiful areas of the Lleida Pyrenees. Being ideal for those who want to do winter sports or go on hikes in summer, the Aparthotel La Vall Blanca is the perfect place for a few really enjoyable days with all the amenities such as a fully equipped kitchen, fridge, ceramic hob with two cooking rings, microwave, a complete set of kitchenware, free Wi-Fi, indoor parking and even more. If you wish to enjoy a holiday in the mountains with your family, partner or friends in Vielha, book the Aparthotel La Vall Blanca at the best price online. The Aparthotel La Vall Blanca’s 35 apartments were created with all those who are looking for somewhere peaceful, simple and functional, in mind, where you can have a restful stay without sacrificing comfort and good value for money. Choose your accommodation in Vielha: our apartments can hold up to up to 6 people. The Aparthotel La Vall Blanca studio apartments offer an area of 24 m², with a simple yet functional design in which to enjoy a holiday with a choice of double bed or 2 single beds, an armchair and television, kitchen with a breakfast bar and chairs, fridge, ceramic hob with two rings, microwave, toaster, Italian coffee maker, kitchenware, bedding, towels and it also has a fully fitted bathroom with a hairdryer and other amenities. The Suites Apartments of the Aparthotel La Vall Blanca are very versatile, being an ample 33 m² and able to hold up to 4 people. Inside you benefit from a separate bedroom with 2 twin beds and an adjoining living area with a sofa bed and integrated kitchen. The furnishings are completed with a breakfast bar and chairs, fridge, ceramic hob with two rings, microwave, toaster, Italian coffee maker, kitchenware, bedding, towels and a fully fitted bathroom with a bath. The Suites Views Apartments of the Aparthotel La Vall Blanca are very versatile, being an ample 33 m² and able to hold up to 4 people. Inside you benefit from a separate bedroom with 2 twin beds and an adjoining living area with a sofa bed and integrated kitchen. The furnishings are completed with a breakfast bar and chairs, fridge, ceramic hob with two rings, microwave, toaster, Italian coffee maker, kitchenware, bedding, towels and a fully fitted bathroom with a bath. The Aparthotel La Vall Blanca Rooftop family apartments have been designed to accommodate up to 6 people comfortably. In their 40 m² you get a separate room with 2 twin beds, a living room with 2 single beds and a sofa bed as part of the furnishing, next to a kitchen that is equipped with everything you need, as well as bed linen and towels. 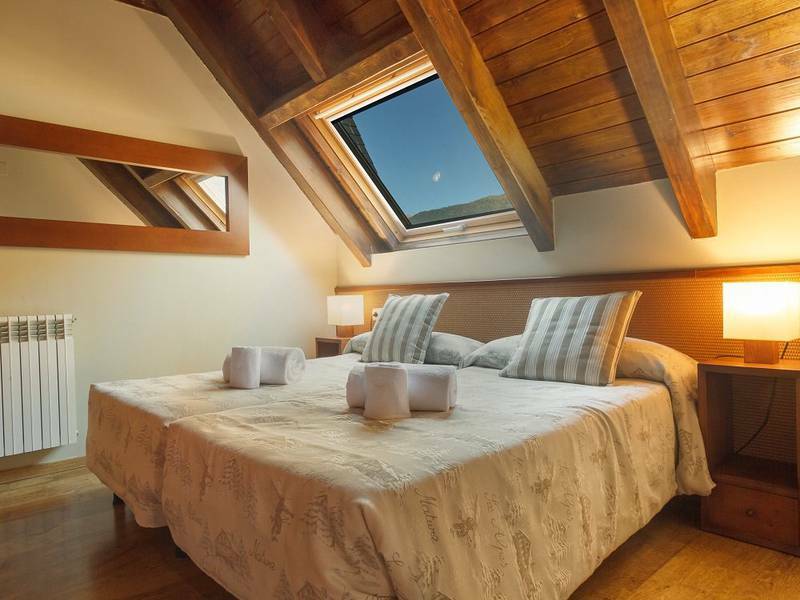 These attic apartments also have a fully fitted bathroom with bath. The Aparthotel La Vall Blanca family apartments with Mountain Viewmeasure an ample 46 m² in size and can hold up to 6 people. They are comprised of a separate room with 2 single beds, a living room containing a sofa bed and bunk beds next to the kitchen, two bathrooms (one with shower and one with bath) as well as bedding, towels and so on. Its location lets you enjoy excellent views of the mountain. The Aparthotel La Vall Blanca Photo Gallery makes it possible for you to get to know every detail of these Vielha apartments. Browse the group and family accommodation photo by photo and find out what your next mountain holiday will be like. Get to know the offers and promotions from the Aparthotel La Vall Blanca so that you can enjoy mountain holidays that are truly affordable. Below are our best rates for apartments in Vielha, in a quiet, family orientated area. Book now at the best price online. If you book a minimum of 7 nights, you'll get a 10% discount on your reservation. Subject to availability. Stays longer than 20 days or monthly: Consult the hotel for special conditions and significant discounts. 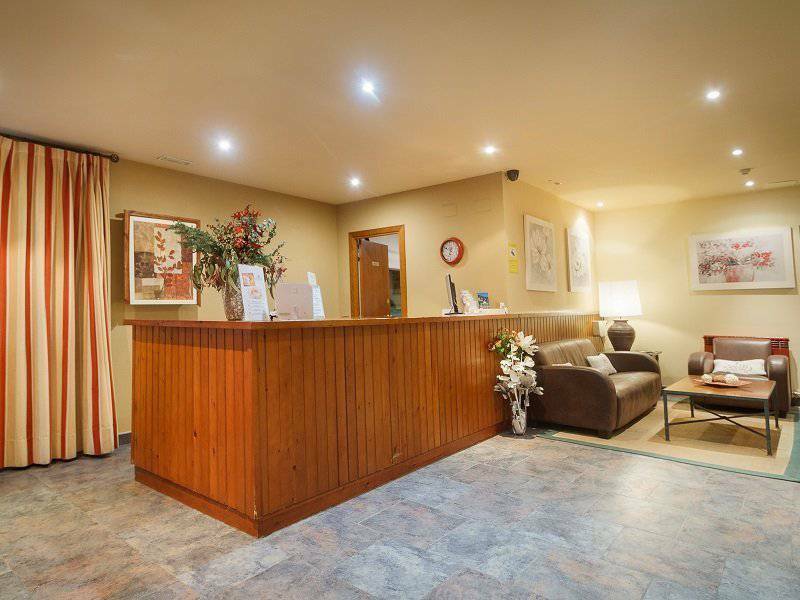 The Aparthotel La Vall Blanca services are thought out to make certain that you have a comfortable stay in Vielha with all the necessities, such as free Wi-Fi, TV area, games room, outdoor parking, cleaning service, adaptations for people with reduced mobility, sauna. The Aparthotel La Vall Blanca is your starting point for an amazing mountain holiday. High season: during August and from December to April it is continually manned from 08:00 to 22:00. Low season: the rest of the year the hours are from 08:30 to 12:30 and from 16:00 to 19:00. Bathrooms are cleaned and beds are made; towels are changed if necessary and this is at no extra charge for the comfort of our guests. Follow all the routes that leave from Vielha and keep your bike safe in one of the free spaces. With space for up to 12 bicycles. If skiing is your sport, there are 20 ski lockers located in the reception area of our apartments. For our clients’ information, animals are not allowed to stay in our apartments. 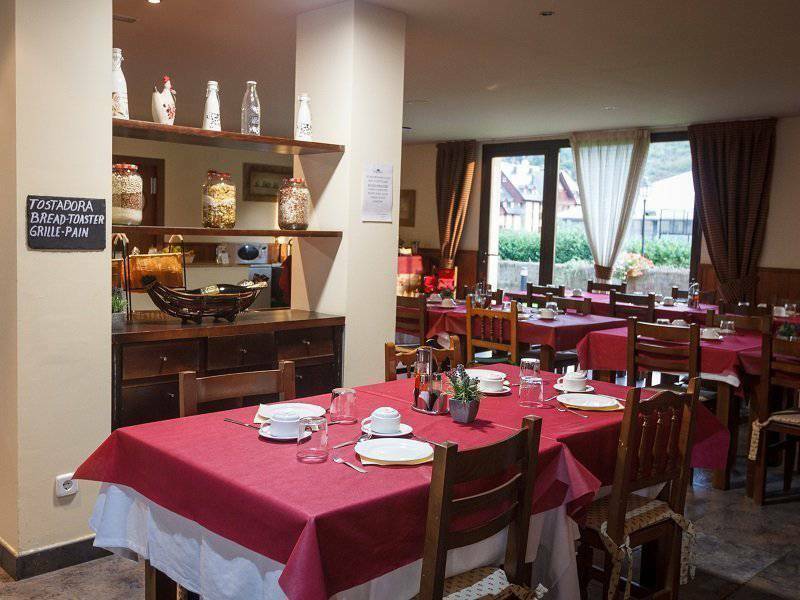 The Aparthotel La Vall Blanca is located on Calle Aneto de Vielha, the capital of the Vall d'Aran and 15 km from the Baqueira Beret ski slopes. These apartments run alongside the landscaped banks of the Garona River and in front of the Ice Palace. 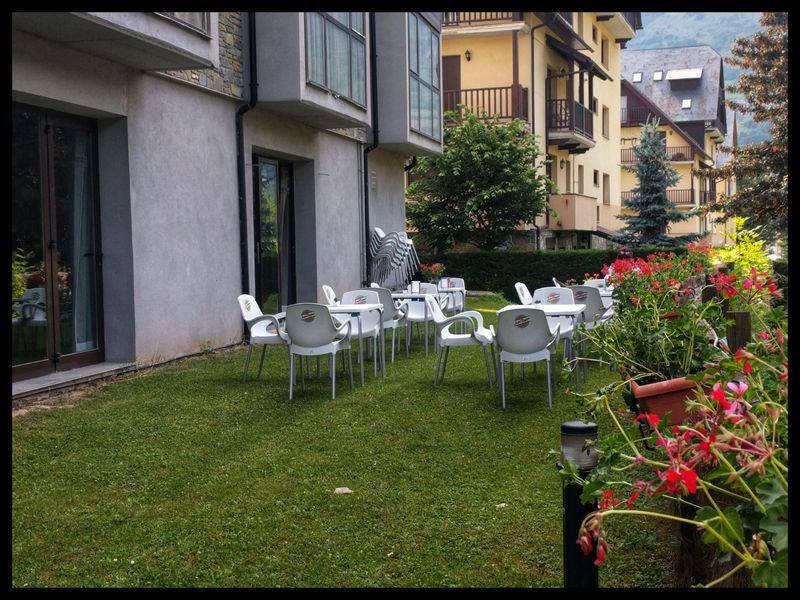 They are perfect apartments for relaxing and enjoying a break in the mountains, both in winter and summer. From here there are all kinds of cultural, sporting and outdoor activities for you to do that Vielha offers such as seeing the waterfalls of Saut Deth Pish and Uelhs deth Joeu, visiting Caviar Nacarii’s caviar nursery, going skiing in Baqueira Beret, touring the National Park d'Aigüestortes i Estany de Sant Maurici and many more natural treasures to experience. Why not check out the Aparthotel La Vall Blanca de Vielha contact details: email, postal address, telephone number or please contact us directly to discuss everything you need to arrange your apartment bookings in Vielha with guarantees on the Aparthotel La Vall Blanca’s Official Website. "Exclusive advantages for web clients!"